← 3 years ago today. I’ve recently gone back to work again, but hey, don’t congratulate me – it’s actually easier than being at home with toddler twins all day. Somehow I had previously managed to avoid traffic problems, for pretty much the entire 4 years I’ve lived in Qatar. Whether consciously or unconsciously – I just don’t tend to go out on the roads during ‘rush hour’ (NB there are a lot of rush-hours in Qatar!). Of course, all this has now changed, with me having been plunged, screaming and kicking, into the chaos that is the 7.30am traffic, as I drop the kids off at nursery and try to get to work on time. On my very first day, I arrived smugly at work early, having figured out a short-cut – well, it was more of a long-cut really – that was a total traffic-beater, which is no mean feat in this town. But getting to work in the car is the easy bit. The biggest challenge I have is parking and then walking to the office. 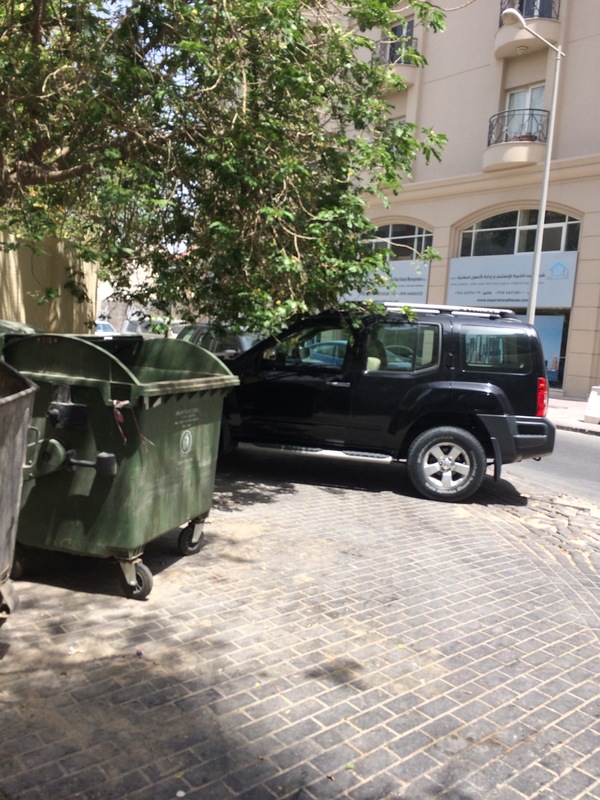 Parking is a huge problem in Doha. Literally every single mall, clinic, school and office seems to be built without adequate parking, a hugely baffling situation when you consider that D-town is being built from scratch and the car is king in this country. Ironically, the place where most of my new colleagues used to park, has now been swallowed up by the development of a new metro station. Metro development has this year stepped up a gear, all across Doha, with the red line, gold line and green lines all well underway. There are 21 huge tunnel-boring machines currently in action beneath the city streets, and roadworks and diversions catch us all out across the city as new stations and bridges are being created. The new metro system is absolutely vital for Doha, which is suffering from severe traffic problems. The first lines are eagerly anticipated to open in 2019. But the use of the metro is going to require a huge change in the mindset of people here, not just from the potential passengers, who I am sure will need some persuasion to ditch their much-loved cars, but also from the authorities. Of course, if people are going to leave their cars at home once the new metro starts running, they are going to have to undertake at least part of their journey on foot. Whether it’s from home to the nearest metro station, or from the station to the office, there is going to be some walking involved. I’m not entirely sure how that’s going to work out during the steamy, hot summers here, but I presume they managed to address that when the Dubai metro was built, and I am naively hopeful that it will also be addressed here in Qatar. 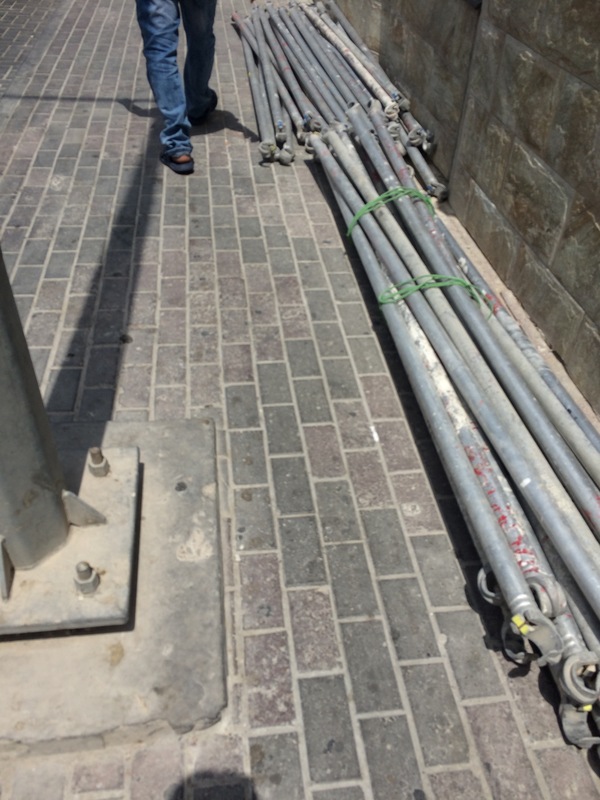 No, the thing which bothers me the most about this new metro, is that walking anywhere in Qatar, regardless of the weather, is incredibly difficult (if not impossible sometimes) and downright dangerous. And I just can’t see this being addressed in the next four years before the metro opens, because there doesn’t seem to be any attempt to even start to deal with it yet. 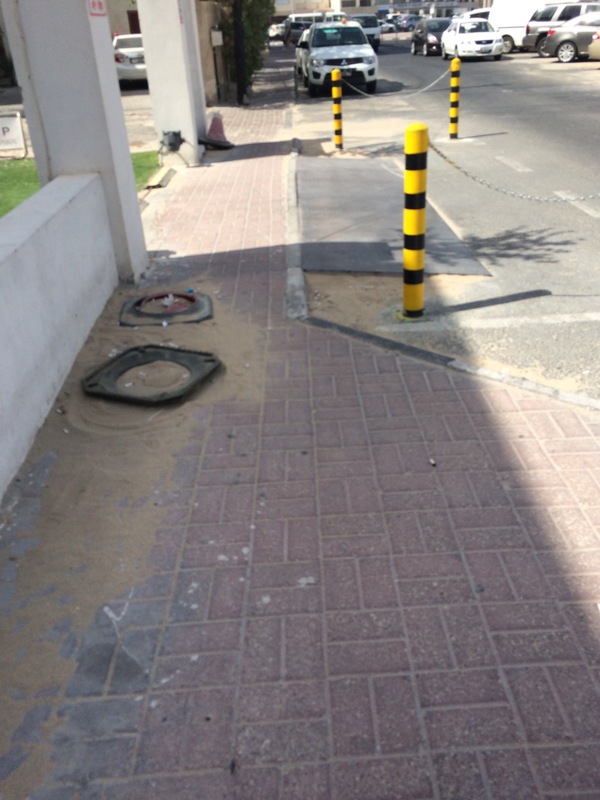 I can recall in detail every single time I’ve tried to walk anywhere in Qatar. There was the time, not long after we moved here, that we went to see the fireworks on the Corniche on National Day. We walked from Al Messilah. It was only about 3 miles, and it was definitely quicker than trying to drive through the crowds, but it was a total eye-opener as to why nobody ever walks anywhere here. On a more recent National Day, we parked up close to the Corniche and attempted to walk down to the parade area with our twins in their double buggy. It was impossible. You thought walking anywhere was bad? Try pushing something on wheels. The last time we ever attempted walking anywhere again was when we went to the Red Bull Flugtag in the MIA park about 18 months ago. 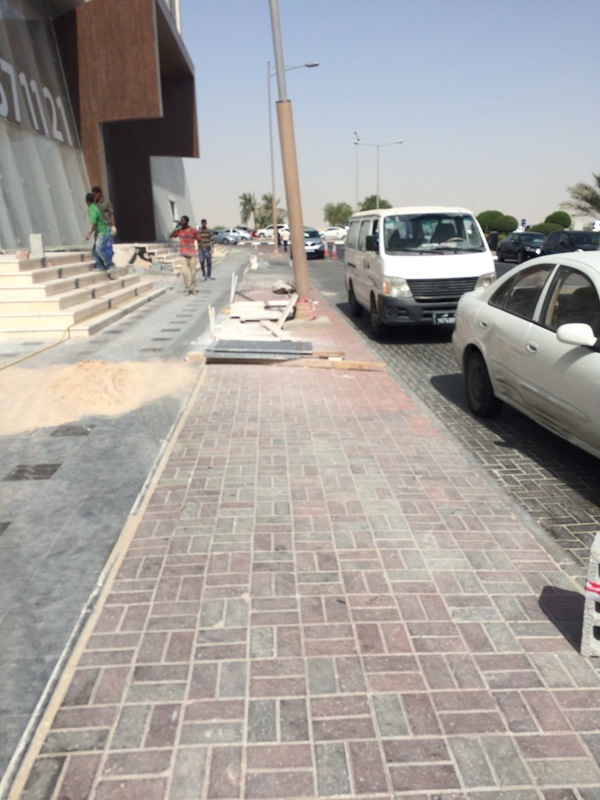 While Ashgal had proudly declared the revamped Corniche road network finally open just a few weeks earlier, we were shocked to discover what a dangerous and unfinished state the pavements were in. Factor in our toddler twins and the whole experience was genuinely scary. It’s part of the reason we have moved to the Pearl. We lived on compounds before, which you could walk around, but it was never as safe as you’d hope, because of speeding idiots. It was also kind of boring walking around the same compound all the time. At least on the Pearl we have, for now, the only truly mixed-use residential and pedestrian-friendly development in Qatar. The boardwalk around the marina is completely pedestrianised and very safe for our twins to run around in and we can even walk to a supermarket! Cars parked on the pavements. Yes it’s illegal, and yes they do dish out tickets in some parts of Doha, but it’s still pretty ubiquitous. And yes, we’ve probably all done it in desperation at some point. But it’s no fun to have to walk into the road, especially on a bend, as I do when I walk this route. I’m not sure this photo does it justice. This one is so deep that I actually need to walk around it to avoid tripping over. The pavement is sinking! Probably caused by problem 1 (see above). Again, pretty common. Just to keep you on your toes. Who is responsible for this stuff? Nobody, it would seem. Imagine trying to push a baby in a stroller along this street. You might look at the next photo and wonder why I don’t just walk around these obstacles. Well, see those slightly darker grey/black tiles among the grey ones on the left of the pavement? They’re marble. It turns out that if you put just one foot on them, you go flying. I found this out the hard way. 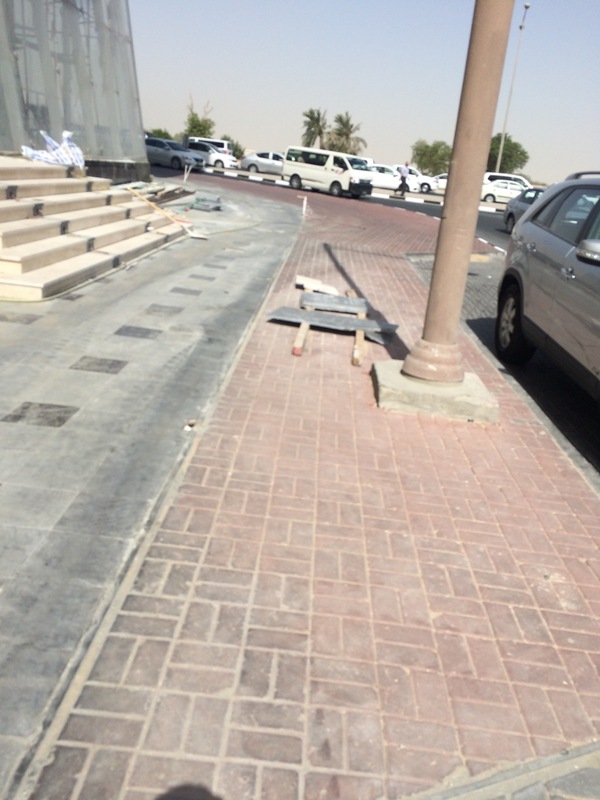 Yes, let’s put really, really slippy tiles on a public walkway. Using the pavement as a construction site. You might think this is a one-off and specific to where I work. It’s not. 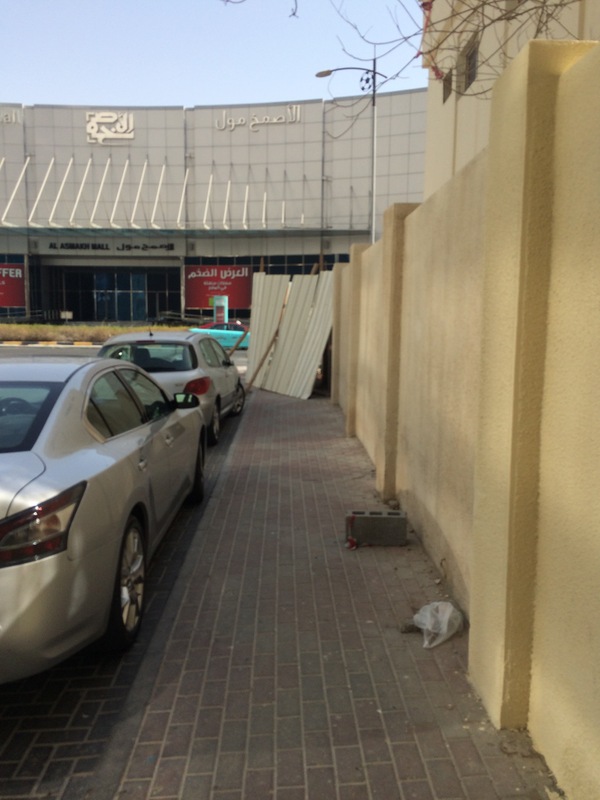 This is Doha – there are building sites everywhere. And I don’t know who is supposed to regulate this stuff, but they seem to get away with spilling out all over the surrounding pavements (and often roads too). Words cannot describe how dangerous this is. The stuff they leave lying around is dangerous. I’ve ripped a long skirt on some of it, and probably could have ripped my leg open if I wasn’t being careful. Every morning, I walk past someone using an angle-grinder here, right in the middle of the pavement. He’s not wearing any PPE and he has absolutely no regard for anyone walking past. I am just grateful that I never need to walk anywhere with my kids. Although it would be nice to have the option. The pavement coming to an abrupt end. This is also very common. Sometimes, it’s designed in, and sometimes there are physical barriers in the way. How is this allowed to happen? 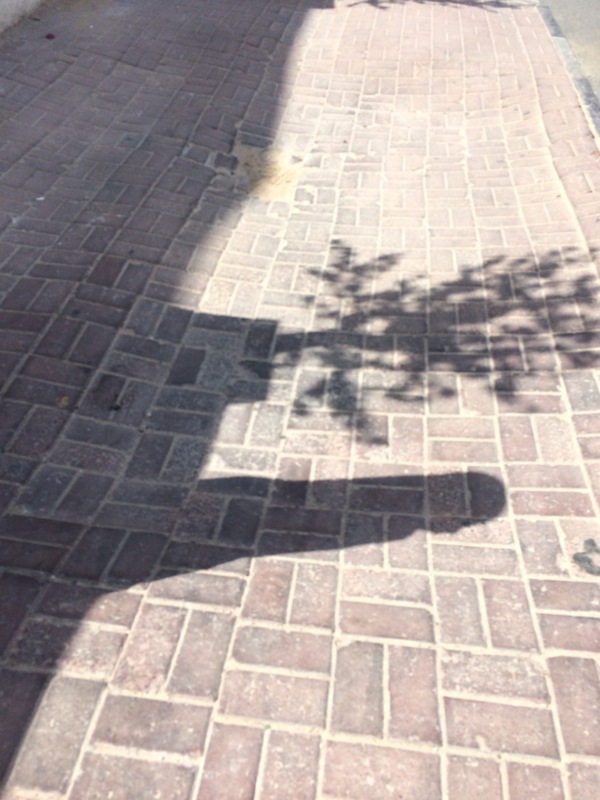 Dearest Doha, I love you, but you have got to address this! How is anyone going to use the metro when even a 100m walk is fraught with such dangers? Not to mention, the place looks a mess with all this construction stuff everywhere. 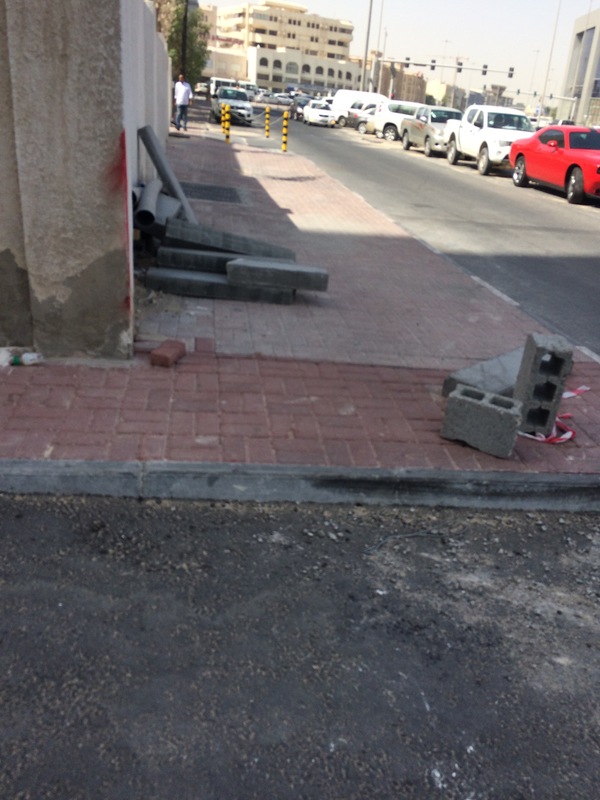 There needs to be a massive crackdown on construction sites violating pavements and roads. The pavements need a complete overhaul almost everywhere in the city. Even when new ones have been built, they quite often end abruptly, or don’t link up to anywhere useful. There are very few places to cross the roads safely. The city roads are generally multi-lane highways with speeds to match. Try taking children out with you, and you’re not going to get very far at all. It needs to change. We’ve got 4 years. Let’s make it happen. With all these new roads being built/upgraded you’d think they would have designed them in here!